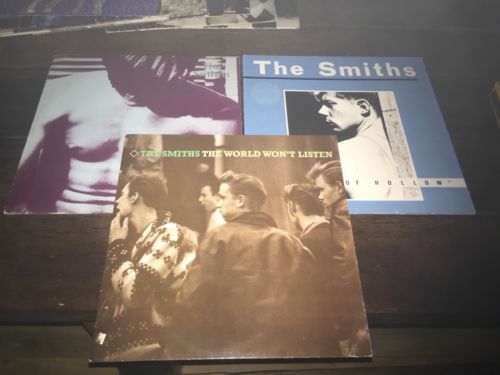 3 x 12” Vinyl albums by The Smiths. All are original vinyl from when they were first released and the vinyl is in very good condition and plays just like you remembered from back in the day. Minor damage/creasing on corner of World Won’t Listen and there has been a sticker removed from Hateful Of Hollow which has left a mark - please see the pictures. If you are unsure of anything DO NOT BID as I will NOT accept returns of these items. Collection preferred from RM11 postcode area literally 2 minutes from j29 of M25 or from E3 area of London. I can post however it will be at YOUR risk and I will make sure items are packaged adequately. Listed elsewhere so may be withdrawn at any time. And a BIG HELLO to all the watchers out there that never actually bid !!! !